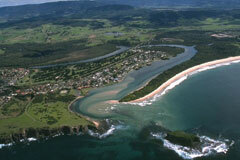 The Wollongong catchment is located in the Illawarra and has a catchment area of 751 square kilometres. Macquarie Rivulet and Minnamurra River. View real-time data from Wollongong Coast Basin on this website. The Illawarra is part of the Greater Sydney water supply system owned and operated by the Sydney Catchment Authority. There are no major water storages to capture and control water flows for town water supply, which is provided by Sydney Water. Sydney Catchment Authority, local councils, mining, steelworks, tourism and dairy farming. As in most unregulated catchments, flows are mostly affected during relatively dry times, when water is low and demand is high. The basin is a thin coastal strip bound in the west by the Illawarra Escarpment with a high density of urban and industrial development. Rural development is constrained in the hinterland and to the south of the basin surrounding Kiama. Environmental water – sufficient flows to maintain river health. As part of the Metropolitan Water Plan, greater Sydney's dams are now releasing more water for river health through environmental flows that mimic natural inflow patterns. Also, the Wollongong Recycled Water Plant supplies up to seven billion litres a year, reducing demand by around 17 per cent of Illawarra's water needs.